Andrew Gn tweed dress with floral embroidery and fringe trim. For in-store inquiries, use sku #2363888. 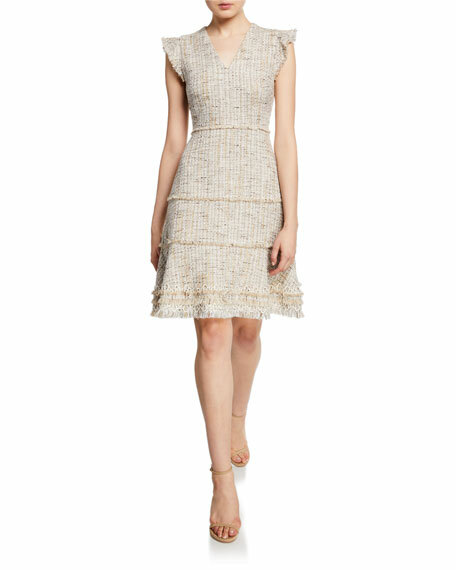 Elie Tahari "Loraine" tweed dress with frayed trim. V-neckline. Cap sleeves. Fit-and-flare silhouette. Knee-length hem. ... fiber/linen. Polyester/spandex lining. Dry clean. Imported. Fendi sweater dress in logo jacquard knit. Crew neckline. Short sleeves. Fitted silhouette. Slipover style. Midi length. Cotton/nylon/polyester. Made in Italy. Givenchy cocktail dress in crepe. Crew neckline. Short flutter sleeves with contrast facing. Shift silhouette. Mini length. Back zip. Viscose/acetate. Made in Italy. Givenchy dress in crepe with contrast panel. Crew neckline. Short sleeves. Shift silhouette. Mini length. Back zip. Wool. Dry clean. Made in Italy.